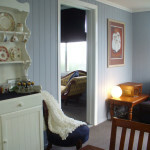 in the South Burnett, look no further than Crane Wines, Kingaroy and their recently opened B&B. Yes at long last, after many years of planning, one of our original goals, to open a B&B guest facility, has finally been realised, and one of Kingaroy’s newest Bed and Breakfast’s is awaiting your visit! 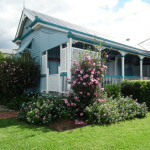 Our B&B accommodation is situated in the end wing of the old Homestead, with a Private Section of the Verandah for exclusive use of our guests. This section of the Verandah has the best view of the valley, and is the perfect spot for relaxing after a hard day’s wine tasting on the South Burnett Wine Trail, gliding with the local Soaring Club, or lying in the sun reading a book. It is also the perfect spot for watching the full moon rise if you are lucky enough to be here at the right time. Access to the B&B is via the purple gate near the cellar door, and along the newly laid path to the steps at the end of the verandah. 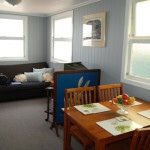 There are two bedrooms, “Wren” and “Rosella”, catering for either one couple by themselves, or a maximum 2 couples who are travelling together. (We will not book two couples who do not know each other, so be assured of your comfort and privacy). 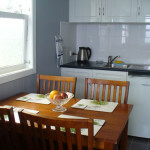 The enclosed verandah at the rear of the rooms has been converted to a medium sized bathroom, a self catering kitchenette equipped with a small fridge, microwave, toaster, tea & coffee making facilities and dining table, and a small lounge with TV and a Record/CD/DVD player. Access to internet is available as well as a library of DVD’s. 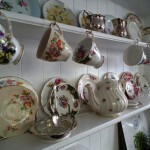 An iron and ironing board is supplied, also hair dryer and a range of home made luxury toiletries. The hallway through to the main part of the house features a sliding door which is closed to ensure complete privacy during your stay. 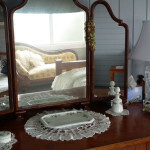 Our 2 rooms are furnished in keeping with the age of the house, and feature some beautiful antiques which have been in Judy’s family for generations. Tasty Breakfast Treats will be supplied for a generous continental breakfast each day of your stay, and a bottle of our own wine of your choice will welcome you on your arrival. Evening meals are available in Kingaroy, or dinner BBQ Packs can be pre-ordered. 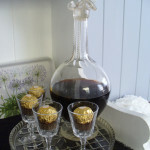 Complimentary port is provided, and there is a BBQ available for guest use. 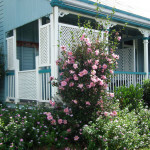 Our B&B rooms are strictly non smoking, so if you are a smoker we do ask that you only smoke outside. Unfortunately due to the working environment children and pets are not catered for. 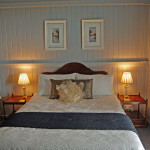 We look forward to your visit to our B&B at Crane Wines. Please check in at our Cellar Door/ Reception area. 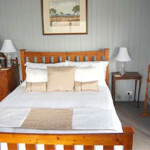 Our staff or ourselves will show guests to their accommodation. Check in is at 2pm, checkout 10am, but early check in and late checkout available at no extra charge, but is strictly subject to availability. A deposit of $100 is required to secure a booking, and the balance is payable on arrival. The booking fee is fully refundable on cancellation up to fourteen days from date of arrival. Your quiet haven with garden. Immerse yourself in the natural beauty of the property. Warmly appointed for your comfort. If you can’t stay with us then we can highly recommend the following local B&B’s.